The Czech aid worker who spent 14 ½ months behind bars in Sudan has said he counted his experience a “privilege” because it enabled him to share his Christian faith with Sudanese prisoners, and praised the country’s “very courageous” Christian minority. Petr Jašek also told World Watch Monitor that two Sudanese Christians who were arrested days after him have been resettled in the US, along with their families, since their release in May 2017. A third has been released and remains in Sudan. Jašek added that, of those with whom he shared a cell during his incarceration, the “most cruel” was a member of Islamic State who had attended secondary school and university in London, and spoke English with a London accent. Jašek was speaking while on a two-week tour of churches in England and Wales organised by the charity Release International, which supports persecuted Christians, during which he encouraged audiences to pray for Christians in other countries who are targeted for their faith. 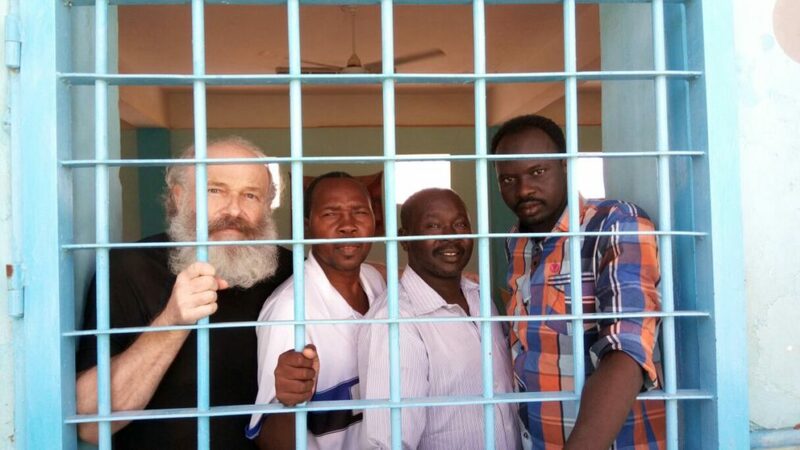 Now travelling publicly as the head of Voice of the Martyrs’ Africa team, Jašek was arrested at Khartoum airport in December 2015 at the end of a four-day trip during which he researched accounts of state-sponsored persecution of Christians. While there, he gave US$5,000 to a convert to Christianity who needed medical care for burns he suffered when, according to Jašek, he was attacked for this faith. Jašek was following up on claims he had heard during a conference for Sudanese church leaders two months earlier. That conference was held in the capital of neighbouring Ethiopia, Addis Ababa. However, Jašek was apprehended as he held his boarding pass home, and taken to the headquarters of the Sudanese secret police where he was interrogated for nearly 24 hours. His wife was only told of his whereabouts after ten days, when the Czech Embassy in Cairo was informed that he had been arrested for smuggling tiger-skins out of Sudan (“which is nonsense – there are no tigers in Sudan,” Jašek pointed out). After a lengthy period of uncertainty, in January 2017 he was finally found guilty of espionage and waging war against the state (for which he could have been handed the death penalty) and sentenced to 24 years in jail. Two Sudanese Christians, Abdulmonem Abdumawla, a convert from Islam who translated for him, and Rev. Hassan Abduraheem Taour, who facilitated his visit, were each sentenced to 12 years in prison. A second pastor, Rev. Kuwa Shamal, who attended the Addis conference, initially avoided a jail sentence but was later held in the same prison as Jašek and Rev. Taour for nine months. The two pastors belong to the Sudanese Church of Christ. In all, Jašek was imprisoned in five separate locations, and spent two extended periods in solitary confinement. He was only allowed to receive letters from his family after two months, after going on hunger strike. He was reunited with Rev. Shamal, Rev. Taour and Abdumawla in the second and fourth jails in which he was held. He was released from the last prison on 23 February 2017 after substantial lobbying from the Czech Foreign Minister Lubomir Zaorálek, the Czech ambassador to Egypt Veronika Kuchyňová-Šmigolová, and various US senators. For three nights before he was permitted to fly home he was kept under close surveillance in a mouse-infested apartment. “They began to slander me; later on [they] beat and tortured me,” he said. For the two months he spent in that cell, he said they treated him like a slave, even forcing him to clean out the shared toilet with his bare hands and wash their underwear in a bucket. He added that they forbade him from praying out loud. The men, who were extremist Muslims from Sudan, Libya, Somalia, Egypt, Kenya and “other Muslim countries”, were “22 to 28 [years old and] all university graduates – doctors, pharmacists, engineers, and, of course, Muslim clerics,” he said. One of them had studied in London, he added. Declining to name the man, a Sudanese national, Jašek said his parents had brought him up in Saudi Arabia, where they worked as doctors, before being granted asylum in the UK in time for his secondary and university education. “He was the most cruel one, and was orchestrating all the beatings and torture for me,” he added. One of the older prisoners, a Libyan national, was known as a “man of the sword” because he had taken part in the beheadings of 20 Copts and one Ghanaian on a beach in northern Libya in 2015. Jašek said that the Libyan was held in respect because when he was 12 he had worked as a bodyguard to Osama Bin Laden. “He said that if I were American or Russian, he’d break my neck immediately,” Jašek said, adding that on one occasion the man removed a length of strong fishing wire from his pocket and showed how he could use it to kill someone in seconds. When Jašek went on hunger strike to protest at being denied contact with his family or the Czech Embassy (the Czech Republic had suspended diplomatic relations with Sudan because of Jašek’s incarceration), after four days guards took him to a hospital where he was forcibly connected to a glucose drip. He asked to be weighed and have his blood tested, and discovered he had lost 15kg, was severely anaemic, and probably had internal bleeding, which was causing him memory loss. He was allowed to receive his first letter from his family in March 2016, three months after his arrest. A second hospital visit two months later revealed that his anaemia had worsened and he had lost a further 10kg. Jašek said that the IS members planned to waterboard him, and so even asked the guards, many of whom feared the Islamists (“who were virtually in every cell”), to transfer him and his six cellmates to a room with running water. The day before they planned to carry this out, his cellmates had him on his knees and were beating him with the broom that was kept in the cell. But he said he experienced peace, was able to pray for his attackers, and could not fully feel the pain. “The Lord showed me a picture of himself [when] he was spat upon and beaten,” he added. After his release, his wife Vanda told him that at that exact time she had attended a Bible study where the leader felt prompted to ask the group to all pray for Jašek. The waterboarding was averted when one guard – whom Jašek commended for “fulfilling his duty” – refused to allow the jihadis to move cells. “When you deal with radical Islamists, you are fighting not against flesh and blood but in spiritual warfare,” he reflected. He said that hearing them muttering personal prayers, in tears, when they could not sleep at night enabled him to reach a place where he could see them as “lost souls”, and he began to pray that Jesus would reveal himself to them “as Lord, saviour and God”. Although the Sudan government is hostile to its Christian population, Jašek said it jails Islamists because they reject its government as secular because it has only adopted aspects of Sharia (Islamic law). Similarly, most Sudanese Muslims do not accept the Islamists, he said. Jašek recounted two periods he spent in solitary confinement. The first one lasted a month and a half, in a cell into which cold air was blasted sporadically. However, he said he “experienced a marvellous presence of the Lord. I was just walking around, praying and singing – that was the first time I could pray out loud and I could even start singing.” His memory of hymns, such as the Czech translation of Thine Be The Glory, returned to him gradually. By the second, which lasted three months, he had been given a Bible. He read it from cover to cover in three weeks, standing by the cell window each day to read it by daylight, and began writing reflections on it. In hindsight, he said, this prepared him for six months of preaching in his last but one jail, a vast complex that could hold up to 10,000 inmates, where he was reunited with Rev. Taour, Rev. Shamal and Abdumawla. The two pastors preached from the prison chapel, which was the size of a 75-bed cell. For Muslim inmates there was one mosque for every four cells. The guards let prisoners remove the beds that were there and replace them with chairs. “That prison was an opportunity to bear witness,” Jašek said. The three figured that they had nothing to lose, being already in prison. “I became a missionary in the prisons,” he mused. “I’m still praying for those who have heard the Gospel and not responded yet.” He described the experience of “seeing the lost find new peace” as restorative, and his physical and emotional health began to recover. He regained 10kg. Jašek, Abdumawla and the two pastors were also permitted to receive gifts of food and money, and Jašek was also able to use a smuggled mobile phone to speak to his family. “The wonderful experience of sharing the Gospel and seeing people saved overshadowed any bad experiences and bad memories from prison,” he said. He praised Sudanese Christians as “very courageous”. When he and the three Sudanese Christians with whom he was tried were waiting for their first court appearance, Christians from the Nuba Mountains, where both pastors came from, travelled for several days, by a succession of buses, to support them in person. Abdumawla told Jašek before their arrests that he had already spent 11 months in prison because of his contact with human rights agencies, and had been tortured with electric shocks. After his release Jašek was debriefed by Czech intelligence officials and the US State Department about his experience. There are parallels between the pressure under which Sudanese Christians have to operate today and the communist regime in Czechoslovakia before 1989, Jašek said, in that churches were infiltrated by informers and those arrested were subjected to similar methods of interrogation. “The secret police have their secret informers among the church members, who report any suspicious activity or any courageous preaching” – which in the Sudanese context could include encouraging evangelising to Muslims, he said. He said he still does not know who gave the secret police detailed information about the church leaders’ conference in Ethiopia. But he said one man he saw at the secret police headquarters he recalled seeing sitting in the lobby of his hotel in Addis Ababa. He believed there were informers in the prison chapel where he and the others preached because “they asked about our cases but were not interested in the Word of God”. The Sudanese pastors’ wives attended the court appearances but Jašek advised his wife and adult children not to, in case they too came to harm. Rev. Shamal was acquitted a month before Jašek was released, and remains in Sudan. Jašek, Abdumawla and Rev. Taour, with their wives, were reunited last autumn at a 50th anniversary dinner for Voice of the Martyrs, which was held in Washington, in one of the US Senate buildings.